The long awaited Ubiquiti EdgeSwitch range is here and it comes in 4 distinct models all containing IEEE 802.3af/at and 24v passive POE. These new switches are designed to be incorporated into large scale deployments of Ubiquiti’s Unifi range of wifi equipment and surveillance camera’s building upon the success of the very popular ToughSwitches. Unlike the ToughSwitches the new EdgeSwitch range are all fully capable layer 2 switches with layer 3 routing support making the new EdgeSwitch range not just a POE power device for Unifi products but an integral part of any network. The 2 24 port models that are available are the ES-24-250W and ES-24-500W each with a total of up to 26Gbps total capable throughput. The ES-24-250W has a total combined capable output of 250W on its POE interfaces making this unit a bit limited for use where all ports may house Unifi Pro or AC devices, this mean some thought and calculation is required when purchasing an EdgeSwitch to ensure it will be capable of meeting your POE needs. 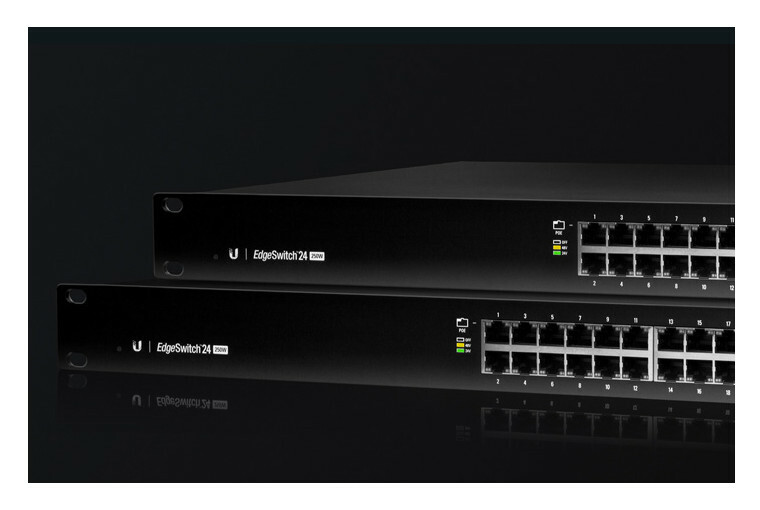 Lucky Ubiquiti have launched 4 Switches, the second 24 port EdgeSwitch the ES-24-500W has a total combined 500W output on its POE interfaces making this the most capable of of the 24 port range and best suited for mixed Unifi deployments including UAP Pro and AC. The 2 48 port models that are available are the ES-48-500W and the ES-48-750W, each of the 48 port series EdgeSwitch come fully loaded with 2 SFP+ ports and up to 70Gbps total non-blocking throughput. The same calculations are needed before purchasing a 48 port EdgeSwitch to ensure it can power all your POE equipment, the best and easiest method do do this is simply to add the total Watt draw from each device you expect to connect to the EdgeSwitch and choose the model accordingly. 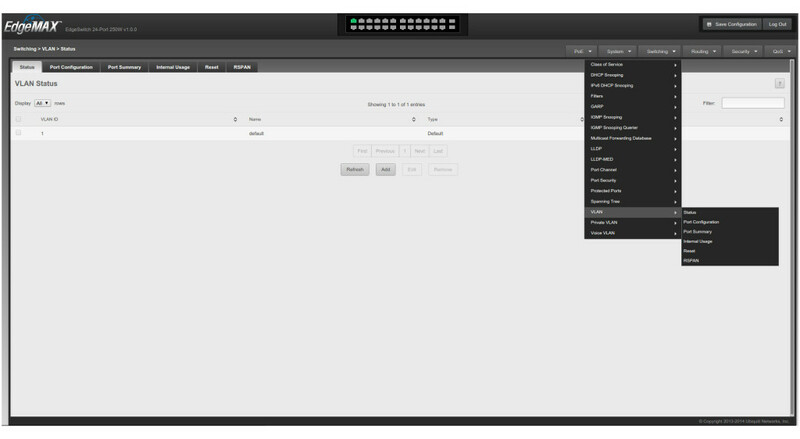 The New UI has been especially built with edge switching in mind, the EdgeSwitch UI has a very professional layout with many available options from routing to switching. The home screen can be seen below. We believe the most common feature to be used on this switch is the VLAN feature, the VLAN settings can be located under the Switching menu which will produce options for VLAN configuring along with private VLAN and Voice VLAN. 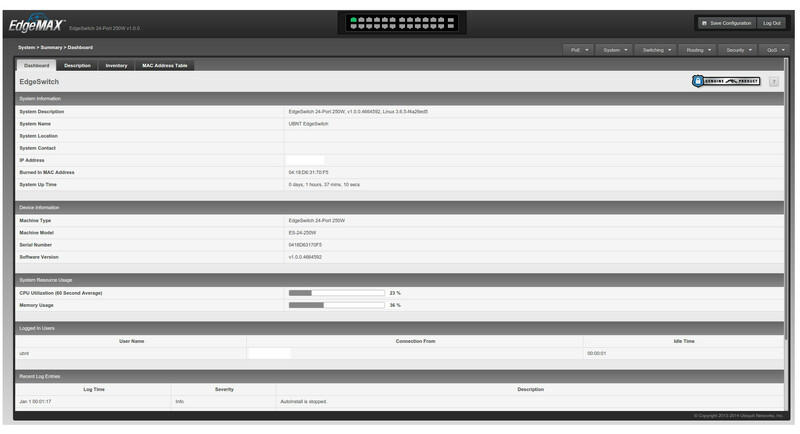 Individual tagging by interface is available from within Switching>VLAN>Port Configuration menu, radius support is also included under the security menu for use with free Radius and windows AD domains. Many Pre-orders have already been made for these switches and we expect the same success as we’ve seen from the Ubiquiti ToughSwitches so grab your EdgeSwitch whilst stock last.